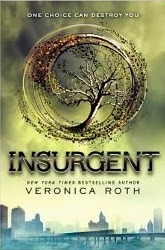 Click to buy Insurgent or read other reviews! Brief synopsis: We pick up with Tris, Tobias and the other survivors right where we left them at the end of Divergent-on a train. Now homeless, all they have is each other. They end up quickly at the mercy of Amity and have to find a way to stop Jeanine and the Erudite before they use a lethal simulation to exterminate all of the Divergent. I had to laugh when Tobias hurls the butter knife-Roth must have a butter knife fetish. What I enjoyed most about this second book in the trilogy was getting to explore the other factions' headquarters and even more, the factionless. As with Divergent, you are always only seconds away from another edge-of-your-seat bad situation for Tris...SPOILER!!! ...of course she creates everyone of them for herself. This girl survives in spite of herself! More on that in a minute. Originality: I was pleased to see Insurgent exhibit more originality than Divergent, as there are so many YA books with strong females and kids being trained for violent times at the moment, and Insurgent does a great job of taking us beyond that. We are thrown into a war that could lead to the complete destruction of all of the factions through a massive simulation attack. The thought of an evil power that has the ability to take complete control of your mind and actions is horrifying. Even your friends and family aren't safe. Characters: So, I do love Tris from the beginning of the series, but I do have to say that I had a few quirks with her in this one. I wonder if any of you feel the same? Tris was tough in Divergent, sometimes too quick to be happy someone might die...too quick to envision herself with her hands around their throat, strangling the life out of them-when she had come from Abnegation background. I know her shooting Will was traumatic, and she can't imagine holding a gun again...the entire book, even though she is faster than a bullet to put herself in immediate certainty of death. I felt like this was drawn out too much. We should have let her cry it out real good and then put her back into more of a control seat. Then, she always forgets her weapon. ALWAYS. She freezes at the most important moments, causing danger for others to get her out. I thought she was smart, a leader and I felt at times, she was made out to be a coward, forgetful and careless which didn't feel quite right from how I felt about her in Divergent. I really enjoyed the interaction between Tris and Jeanine. Tris did come out with her confidence in these moments, which was good to see. SPOILER... I wish Tris had been the one to off Jeanine. I felt the same way when President Snow was shot by a stray arrow-that should have been Katniss. I was glad Tobias finally stood up for himself and put Marcus in his place. I like Tobias and hope to see more of him in Allegiant. He and Tris were sort of off in this one with everything that happened. Recommendation: Insurgent goes well with a bowl of chex mix because there is stuff scattered everywhere, like I felt Tris was in this one. I just wanted to get her to stand up tall... I love her still. I enjoyed the book and look forward to reading Allegiant!